As billionaire investor Warren Buffett likes to point out, he pays a lower annual tax rate on the tens of millions of dollars he earns than does his secretary, who makes $60,000 a year. It’s an illustration, he says, of how the backward and loophole-ridden the US tax system is. 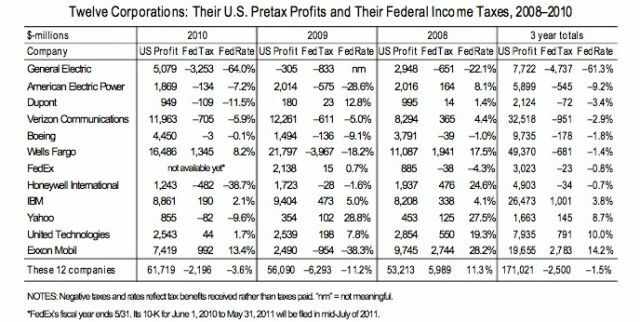 Here’s another: Between 2008 and 2010, a dozen major US corporations—including General Electric, ExxonMobil, and Verizon—paid a negative tax rate, despite collectively recording $171 billion in pretax US profits, according to an analysis by Citizens for Tax Justice. Taken together, these companies’ tax burden was -$2.5 billion, and ten of the companies recorded at least one no-tax year between 2008 and 2010. Not a single one of the companies paid anything close to the 35 percent statutory tax rate. In fact, the “highest tax” company on our list, Exxon Mobil, paid an effective three-year tax rate of only 14.2 percent. That’s 60 percent below the 35 percent rate that companies are supposed to pay. And over the past two years, Exxon Mobil’s net tax on its $9.9 billion in U.S. pretax profits was a minuscule $39 million, an effective tax rate of only 0.4 percent. Had these 12 companies paid the full 35 percent corporate tax, their federal income taxes over the three years would have totaled $59.9 billion. Instead, they enjoyed so many tax subsidies that they paid $62.4 billion less than that. If just these 12 companies had paid at a 35 percent tax rate over the past three years, total federal revenues from corporate taxes would have been 12 percent higher than they actually were. CTJ’s report comes as President Obama and Congress eye changes to the nation’s corporate tax code. The president says he wants to eliminate the many loopholes American companies use to reduce their tax liabilities, but offset those changes by lowering the overall corporate tax rate—what are called “revenue neutral” reforms. For their part, Republicans simply want to lower taxes across the board, for individuals and corporations alike; they say American companies already pay too much when compared with competitors in the rest of the world.